If I had to pin a core theme on the first two weeks of Halberd's production, it would probably be "Raising Questions". As I expected, the nature of the project has forced me to think a lot about how to use DFGame properly. Because this project is both very different and much larger than previous any work I've made using the framework, many unknowns in DFGame are being brought to light for the first time. Let's discuss a couple of them! With DFGame, it was always my goal to add less 'core' features as optional modules. I had a pretty good general idea of how this was going to work, but I'd never actually tried doing it until recently. I needed a new DFGame module for handling tilesets and tilemaps in Halberd, so I finally gave it a shot. I'm happy to report that it worked pretty smoothly! Everything mostly worked out of the box, even the OpenGL shader embedding Just Worked™ how I wanted it to with basically no modifications. The only thing that I had to figure out was how to properly use relative filepaths in Meson subprojects, and that only took about 5 minutes. This good first impression was very reassuring, and has me excited to expand DFGame even more in the future. In less positive news, working on Halberd has also exposed a massive flaw in DFGame's design: None of the assets have any idea where they came from. In normal circumstances, this doesn't really matter. Who cares if that sprite doesn't know where it loaded its textures from? As long as they're correct, the game will work fine regardless. 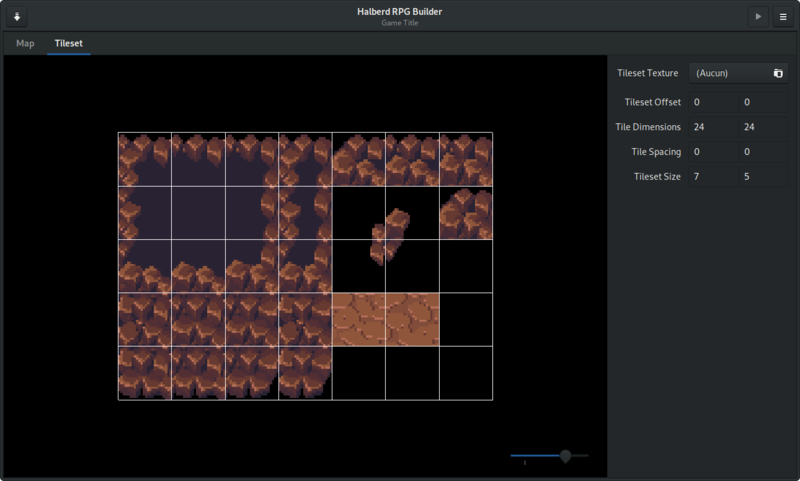 Even in a level editor, it doesn't matter too much (since you ought to be using the same backend as the game anyway). Unfortunately, this information is vital when building something like Halberd. After all, how could you possibly update a tileset, when you have no idea where to save it? Even if you track the path you passed to the load function, that won't help much when you realize that you also need to write the texture's filepath in the same file. Clearly, this is a pretty major roadblock. There are a few ways to solve this problem, but I'm still considering my options. I want to be sure that the choice I make here won't screw me over later. It may seem negative to see new problems crop up, but I see it as a positive. The sooner I'm faced with unknowns in DFGame, the sooner I can test them (and fix them if needed). I don't expect anyone else to ever find and use DFGame, but on the off-chance it happens someday I'd rather have all the big questions ironed out ahead of time. In the more immediate future, having the answers to questions like these will also simplify any future projects with similar needs. It's not the prettiest, but I think it's a pretty solid MVP-level feature. Now, I just need to keep going and finish the rest!